I know many of you are smarter and more experienced than I am. If you know clutches, lay some knowledge on me! If you don't, read on, anyway. It's a little long, but it's fun in a geeky car-guy kinda way. Okay, I'm no clutch expert. I've replaced more than a few of them, but usually because they were flat worn out or a clutch related part failed (pilot or throwout bearing, oil seal, etc)... or maybe for a performance upgrade, or more often a "just because the engine is out" replacement. And the important part, I've never really looked at them all that closely. Sometimes they're worn, sometimes they're not. Never really gave it much thought, but mostly just looked at friction surfaces. I guess I'm just getting more curious in my old age. I did learn a couple years ago with a lightweight Miata project that an "unsprung hub" clutch disk is a pretty awful thing to drive. Those little springs in your clutch really do have a purpose! We'll come back to that. The purpose of this thread isn't really to provide any conclusions. Merely some discussion, food for thought, and perhaps enlightenment based on my measurements and observations of the Mirage clutch that I happen to have on my kitchen table. (and the wife hasn't complained... maybe she finally gave up?) Opinions, experiences and feedback are welcome. So, what I have before me is a 40,000 mile Mirage clutch. The first 30k miles happened over 2 years, likely a highway commuter vehicle. The last 10k were all me over the past 15 months, mostly casual city driving, and 35 autocrosses (214 autocross runs with appropriately aggressive launches and hard 2nd gear shifts). Uh, well, honestly... I didn't look at it too closely. It definitely wasn't showing enough wear that I even gave it any consideration. Probably about the same as the pressure plate. It's been sent off to get lightened. Ah, now this is the fun part. This car has always had a bit of a noisy clutch. Just a bit of a rattle at idle, and a horrible resonant buzz if you get on it too hard in reverse. (used to do it every time I backed up my driveway until I figured out that it didn't do it if I babied it) I figured I'd just not worry about it until it became a problem, got a lot louder, or I pulled it out to put in a lighter flywheel. May hand was forced when an engine problem required the engine to be removed... time to do the flywheel and clutch! The only clutch problems I've heard of from this generation of Mirage have been noises similar to mine, and one clutch with a broken spring in the clutch disk. So, the first thing we're looking at is the clutch springs. There are four springs. Actually, eight. Each of the main springs has a smaller spring inside it. All of the springs are quite loose. They rattle, they rotate easily, and they can be moved foreward and back about 1.5-2mm. There's the noise I've been hearing. Pressure plate and flywheel are fine. Very little wear for 40k miles. The clutch disk friction surface is also fine. The springs in the clutch disk are possibly a problem area, especially for an aggressive driver. I'm gonna add two more posts here. One to expand on how the clutch disk works and what I think happened or is happening. (photos included) The other to compare the replacement clutch disk with the old and provide some interesting measurements that you're never going to need. What's up with the cluch disk? The stock clutch disk is made by Exedy. They make clutches for a LOT of new cars, and are an extremely common aftermarket replacement option. Definitely a "standard" among clutch manufacturers, so that's good. But, this is definitely not a "performance" clutch. It has at least one area of weakness that is readily apparent to me after a year of autocross competition. Mind you, a year of autocross for me is equivalent to about 3 years of what a typical "casual" autocrosser would do. I do at least two events per month, 12 months per year, often with other people taking runs in the car, etc. So, if I've done 15 months of autocross... and it seems I'm saying that the clutch would have failed in 30 months... that's with MY use. A typical autocrosser would get 3x as much out of it... that's 90 months! So, please don't think I'm saying the clutch is junk. It's not. FRICTION SURFACE - On each side is the "organic" friction surface. I don't even know what it's made of. It's like fiber-reinforced resin of some sort. Designed to take a lot of abuse with minimal wear. It's riveted to the marcel, and plenty adequate for the task at hand. MARCEL - A very thin wafer of metal between the two friction surfaces. It's got a slight wave to it and acts as a "spring" to make your clutch engagement smoother. It fully flattens under the clamping load of the pressure plate. Interestingly, all of the torque of your engine is transmitted through this thin plate of steel. Pretty amazing if you look at it. BODY - For lack of a better term, I'm calling the outer part of the clutch that you can readily see the "body". The Marcel is attached to this, and the two sides are riveted together with spacers between them. HUB - This is the center piece that fits over the splined transmission input shaft. The hub is attached to a plate that is sandwiched between the two sides of the clutch body. On the Mirage, this attachment appears to be insulated with a thin nylon bushing, probably to soak up some vibration. SPRINGS - The springs go between the hub and the body of the clutch. That springy forward motion you feel as you release the clutch is these springs in action! They absorb some of the torque and then release it. Sort of gives it a little "bouncy" feeling. Without these springs, clutch engagement becomes VERY harsh. That makes starting the car off from a stop very difficult. It also puts a lot of torque INSTANTLY into the driveline, which can be bad for transmission and differential parts. On the plus side, clutch engagement happens VERY fast, and shifts can be a lot quicker. Potentially good for track racing (where the launch isn't important) if you don't mind putting extra wear on your driveline. Pretty horrible for a daily driver. If you ever have the option to choose unspring, don't! When you release the clutch pedal, the pressure plate clamps the friction surfaces against the flywheel. As the marcel compresses, the clutch engages smoothly, and the body of the clutch disk turns. The body compresses the springs against the hub plate, which further cushions the engagement, and the car starts to move. As the clutch is fully release, the springs normalize and release some of their energy. They continue to absorb some of the variations in torque from the engine, thus not introducing ALL of the engine vibrations to the driveline. I'm going to guess that the springs are either too few, or too soft. If you look at a lot of clutches, you'll see that many of them have 6 springs. Ours has 4. This is likely where they tried to save some weight, not a bad idea. And the springs are probably soft because they're trying to really smooth out the driving experience. It's an economy car, not a race car! Here's one of the springs in my clutch. Notice the grooves in the end of the spring? Bonus points: notice that the grooves are really bad on one end and not so much on the other? One end is the end that takes the load on acceleration, the other under deceleration. Hard launches are killing these springs. Hard downshifts, not so much. (though there is wear on both ends) All four springs show the same wear patterns. 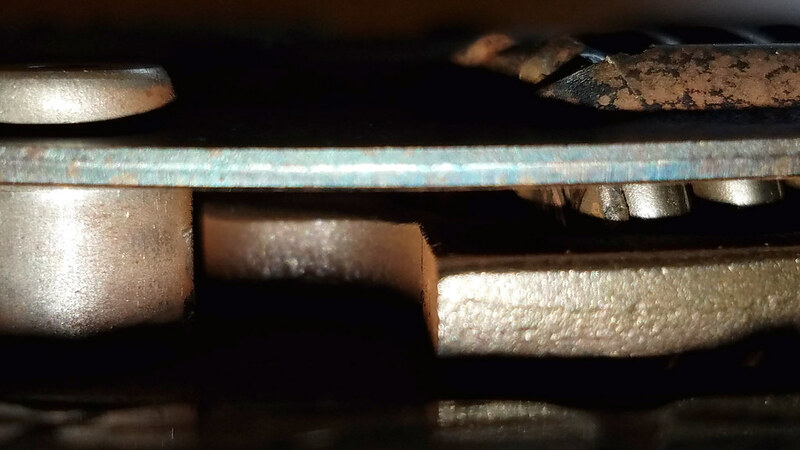 The grooves are where the spring contacts the hub plate in between the two body sections. Hard to see. You can't even see the wear on the springs until you rotate them to where the worn spots are visible. It's that silver-colored plate in the middle that's creating the grooves. 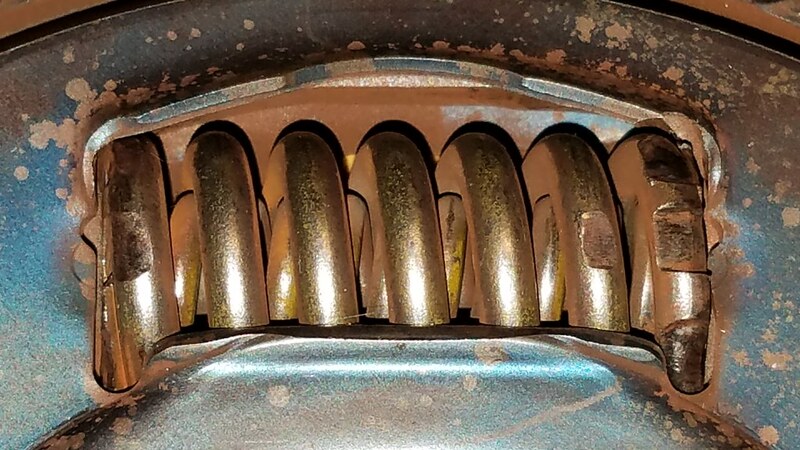 Here's a close-up of the most worn spring. It shows something that I didn't even notice before I took the photo. There's a crack in the "body" plate at the corner of the spring window, AND there's a chunk broken out of that same corner! Sure, hard launches and all that... but, come on... the car only has 74 ft/lbs of torque! While I feel the rest of the clutch system (it's torque HOLDING ability) is over-built, I think this whole spring setup is inadequate (for my purposes). The springs are too soft, and/or too few. And the body plates that hold them in are either too thin, or poorly designed. I'm not faulting anybody here. The thing is designed for easy and cheap production and assembly, and designed to be daily driven in a normal fashion... and expected to last 100k miles. It's fine for what it was designed for. My clutch springs and the body material that supports them are wearing. A lot. They already can move as much as 2mm fore/aft, and rattle quite easily. The grooves in them left unchecked, and continuing my current driving habits would eventually cause chunks of the end of the springs to break off. I'm guessing it would happen no later than 80k miles. 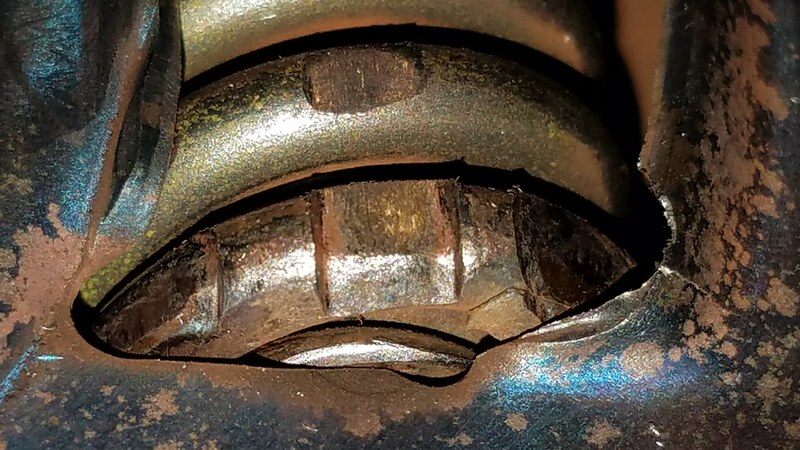 (but, if we assume that most of this wear happened during MY 10k miles with the car, then it could happen a lot sooner) At that point, the spring action is going to greatly degrade. Things aren't going to feel right, and all sorts of noises could ensue (depending on where those broken pieces end up!). Another thing that could happen is that the body plate openings could wear to the point that a spring actually falls out. Is this something that the average driver needs to worry about? Likely not. As long as you don't make a habit of making full-throttle quick launches and shifts, you should be okay. Practice a little bit of "mechanical empathy". You can still accelerate at full-throttle, just don't HAMMER the throttle. Roll into it smoothly. Or just enjoy your car in the way that you choose, and expect to replace the clutch at some point. Alright. Bad clutch disk. Replacing it. I could have taken the clutch disk to a local clutch shop that does custom racing clutches and had them rebuild/improve it. But, instead, I opted to just buy a clutch kit that was readily available on Amazon for $105. It's US made by a company called Southeastern Clutch. The pressure plate looks exactly the same, but I didn't measure anything. Didn't even weigh it. It's possible that it could be a little heavier or have slightly more clamping force. Or the opposite. I'm trusting that it's at least somewhere close to stock equivalent. Why wouldn't it be? FWIW, the kit comes with a new throwout bearing, and a clutch alignment tool. No pilot bearing because the car doesn't use a pilot bearing. 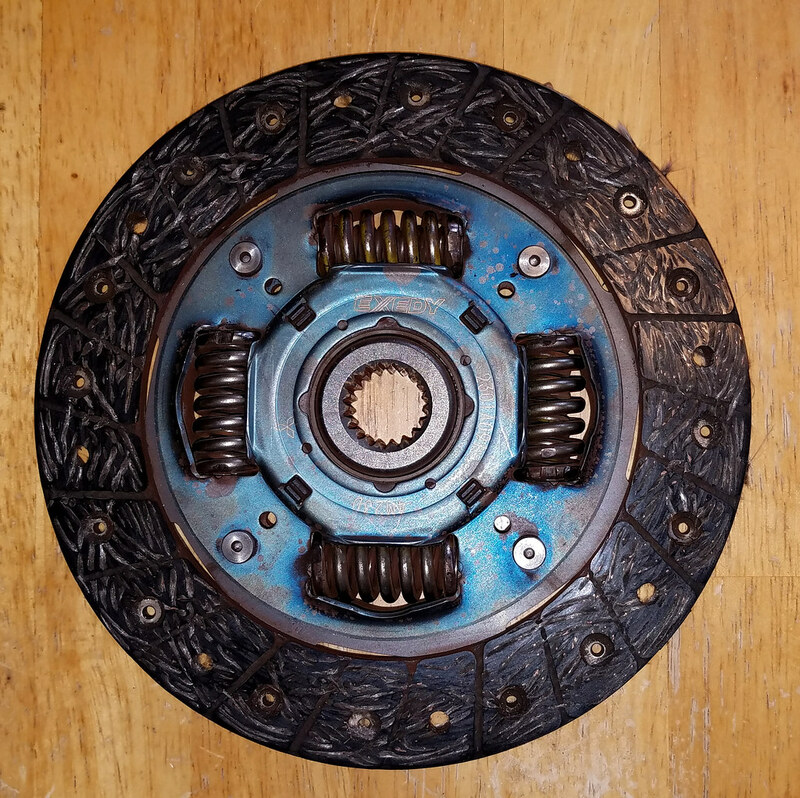 Being particularly interested in the clutch disk, I went ahead and put them side-by-side and did some comparative measurements and observation. Almost exactly the same. No markings on it at all (so it's not a rebranded Exedy or something, they likely make this in-house), but precious few visible differences from the stock clutch. Both disks use springs made from 3.6mm thick wire. (there are also secondary smaller springs inside those springs... I didn't measure those) The springs are approximately 190mm diameter (hard to measure that without disassembling the disk), and 37.5mm long. Knowing the wire thickness and the diameter of the spring, all we need to know next is the number of active coils in the spring to determine the spring rate. I don't care what the actual rate is, so I didn't calculate it. But... The stock springs have 6 active coils and the new springs have 5 active coils. All else being equal (and it is), this means that the new clutch has springs that are a little stiffer than stock! Score one for Southeastern Clutch! Maybe they used that part because they just happened to already stock it, and it was close enough. Maybe they did some math and decided that they didn't want people complaining that their clutch springs bounce around and break too easily? Can't say why. But, the fact that they are stiffer springs... based on my observations, I think that's a good thing. The springs on the new disk do rotate fairly easily, but nowhere near as easily as the worn stock clutch. The fore-aft movement of the springs in the worn stock clutch is up to 2mm. The new clutch is barely 1mm, but there is some movement. It's a design thing. The friction surface has 24 segments molded/milled into it. I think the purpose of those segments is to compensate for wear. As the disk gets thinner, the clamping force exerted by the pressure plate will be less. Increasing the surface area that little bit would help bring the load capacity back to where it should be in spite of less clamping force. That's just a guess. Interesting difference: The stock disk has a hole drilled in ALL of the 24 segments. But, there are rivets in only 16 of the holes. 8 of the holes are unused. They are there purely for easy of assembly, almost surely automated assembly. No worry about orientation of the friction disk, one less production step. The new disk only has 16 holes. One for every rivet. This probably means that it's hand-assembled. Having 8 less holes in the friction surface, the new disk has more surface area. Enough to matter? Probably not. The clutch already seems to be over-built for the application, so it really doesn't matter. One peculiar difference between the two is that the new disk is 1.5mm thicker. The design looks exactly the same, they just used slightly taller spaces between the two body halves. No idea why. I didn't measure the plate thickness... if they're using thicker plates, well, that would be awesome. Same. Looks like exactly the same casting. Same thickness, same splines, same diameter. The difference could be the longer spacers used on the new clutch, or simply that the stock clutch is a little worn. It's only a 1.4 oz difference. That ain't much. Jesus that's a lot of notes you got there from a clutch swap. Hopefully it's as good as stock. TIL how the finer parts of a clutch work together from Loren's "measurements & observations." Yeah, it's stuff that's easy to not think about. The only reason I'm thinking about it is because this particular clutch obviously has a weak area that I wanted to explore. CaptainSquirts wrote: Jesus that's a lot of notes you got there from a clutch swap. Hopefully it's as good as stock. That’s what you do when it’s conveniently located on the kitchen table, examine and take notes, cmon Dan. Can the mirage break traction on the launch? Also do you slip the clutch on launch or just dump it? I usually slip the clutch a bit when I launch. I really don't think about it much. I guess I slip it to get rolling, and then dump it. Something like that. Yes, the Mirage can break traction on a launch. It chirps 2nd, too! Loren wrote: I usually slip the clutch a bit when I launch. I really don't think about it much. I guess I slip it to get rolling, and then dump it. Something like that. I've been the starter. Loren launches hard. 1WD. Did you think he was sand bagging? Loser w/Awd. From the look of his clutch, no, no I did not think he was sand bagging . Kinda off topic but when I was discussing with the transmission builder, I asked about (dont remember exact question but something along the lines of this) launching and durability of the drivetrain from it. Basically he said launching for autocross cars(ones that run high springrates/stiff tire sidewalls is really rough on the drivetrain since there is basically no flex going on. He said something along the lines of when launching, its good if the car squats(dips down) but running stiff springs and tires with hard sidewalls, there is basically none of that so the drivetrain takes the brute of the "force/shock/load, whatever". He recommended not installing a clutch that was rated way higher in hp/torque capabilities than what you needed. Also "for the evo at least" to drop the 2 step from 5500 to 4700-4800. I wonder when launching if it's actually beneficial to get a little wheel spin so all that energy is kinda being expelled. Not sure if it works like that by I would think it does? Anywho, I'll take off my safety/reliability hat now. I think the perfect launch has no bog and just a hint of tire spin. I usually bog, but every now and then I get it right. With high power awd launches on grippy tires, you can think of the clutch as a "fuse" for the drive line. Btw what was the original clutch disc thickness new compared to now? Mine was 8mm new and the one I just replaced (30k miles and almost 3 years of autocross) was 7mm. So only lost 1mm of material on the clutch which I expected a lot more used up. I measured that, but I may not have written it down. The new clutch and the old clutch were nearly identical. Almost no clutch friction surface wear at all in 40k miles. Those springs though... they took a beating! I would think the springs would crack or something and then come all apart rather than get gouges. Gouges I would "assume" something is digging into it. I would think that you didn't spend enough time looking at the photos or reading the description of what caused the gouges. It's all pretty obvious if you look at it. The problem is simply that the springs are too soft for the way the car is being driven. Loren wrote: Yes, the Mirage can break traction on a launch. It chirps 2nd, too! Of course the Mirage can break traction on a launch -- it's FWD. Better than that, 1FWD...physics and the driveline promote wheelspin under acceleration.